3 or more only $18.00 each! 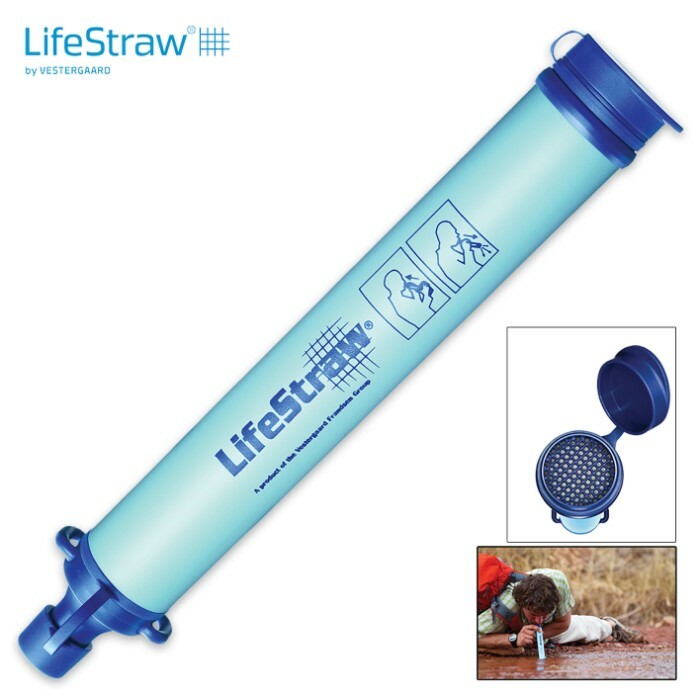 Includes lanyard; 8 3/4" x 1"
Lifestraw's personal water filter enables you to drink water from virtually any source safely, providing you with high-quality H2O when you're in a pinch. 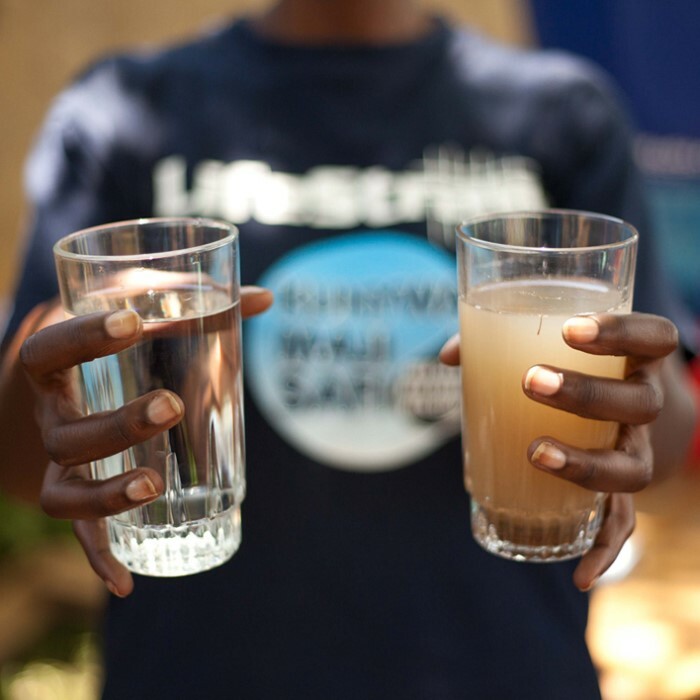 Drink right from ponds, rivers, streams or even a mud puddle with the confidence of knowing that the Lifestraw removes 99.9999% of waterborne bacteria and protozoan parasites. At only 2 oz. 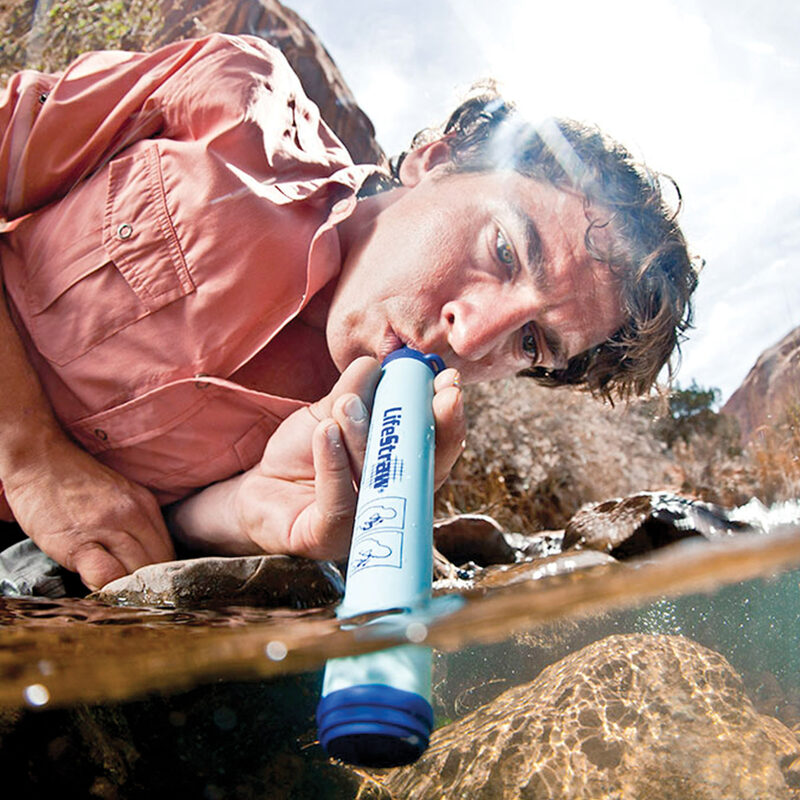 in weight, the Lifestraw is a must-have emergency preparedness device for every bug-out bag and outdoors pack as it won't weigh down your gear like heavier personal water filtration alternatives. It's effective in filtering up to 264 gallons of contaminated water (1000 liters). The patented hollow fiber membrane filters impurities down to 0.2 microns. Includes wrist lanyard. Measures 8-3/4" x 1" overall. I once drank from a mosquito infested, dirty, pond and the water came out crystal clear and tasted fine! Great for any survival situation! Also! DO NOT drink salt water (this includes urine, the straw does not filter out salt), any water with chemicals (such as a pool, the straw does not filter out chemicals), and do not always 100% rely on it. Some diseases it may not filter out, but other than that, it's amazing! Also, don't forget to blow out through the straw once you are finished drinking, this way it is cleared of any debris and is ready for the next use. These things are awesome. The way the world is going, you may as well get a few of these just to be sure to have clean water on you at all times. I will be buying more. Thanks guys. Got it fast and it works great. The drinking straw is very compact, easy to carry, and ready when you need it. If out on a hike,hunting, or fishing, it is ready to use to give you fresh water, without having to carry extra weight, like a lot of heavy water. I would recommend it for everybody to keep handy. Keep one in your pack, car, & even your house. Took the wife and grandchildren (3) for a hike in the canyon;everyone had a 16oz bottle of water at the start. However 6 miles in Texas heat, we were able to reach the creek on empty.My wife told me we should have brought more water,I knew the right answer. Yes Dear,as I unpacked one of the Life straws I bought from ya'll; had a cool refreshing drink from the creek and asked if anyone else was thirsty? Tested and approved by Grandmaw and the children. M.G. TRY PACKING IN FIVE GALLONS OF WATER 12 MILES. THIS DEVICE MAY BE MORE THAN VALAUBLE. I've read about this product and it seems to be a good emergency system. Hope not to have to use it, but it's there if I need it. I have only heard amazing things about these bad boys so when I saw it for 20 dollars, I said sold. It can filter some crazy amount like 250 liters of water with just one straw. I camp and hike a lot so worse case scenario it is nice to know I can dip this bad boy into some raw/dirty looking water and still get what we all need, water. Have not tested it yet because it is my back up of a back up but I am confident that if it came to it this little guy has my back. this is what we all should have in hand for hiking or catastrophe. Great stuff. Great filter. Awesome price. You can't go wrong with a filter like this. I bought 4 for the family.